Creamy smooth red velvet cheesecake gelato will make you melt! I love the word “gelato”. It’s like you are French kissing the air. G-E-L-A-T-O. Feel how your tongue hits the roof of your mouth? It’s a seductive little word. There is nothing seductive about the word “ice cream”. Ice C-R-E-A-M makes you smile. Your mouth spreads into a little grin each time you say those two words. You eat gelato in a dimly lit restaurant with checkered table clothes and empty bottles of chianti holding dripping candles. You sit close to someone as you indulge in this silky desert; one bowl, two spoons, close lips. Ice cream on the other hand is eaten in a cone with sprinkles. Think county fair, carnivals and birthday parties. Balloons abound and so do screaming children. There are games, rides, ice cream rimmed mouths and chocolate stained shirts. Gelato typically contains less fat than ice cream. It often doesn’t contain egg yolks like ice cream and it is usually churned at a slower speed so less air gets incorporated into the gelato, unlike it’s fluffy ice cream counterpart. Gelato is served at a warmer temperature too, which keeps it soft and supple. 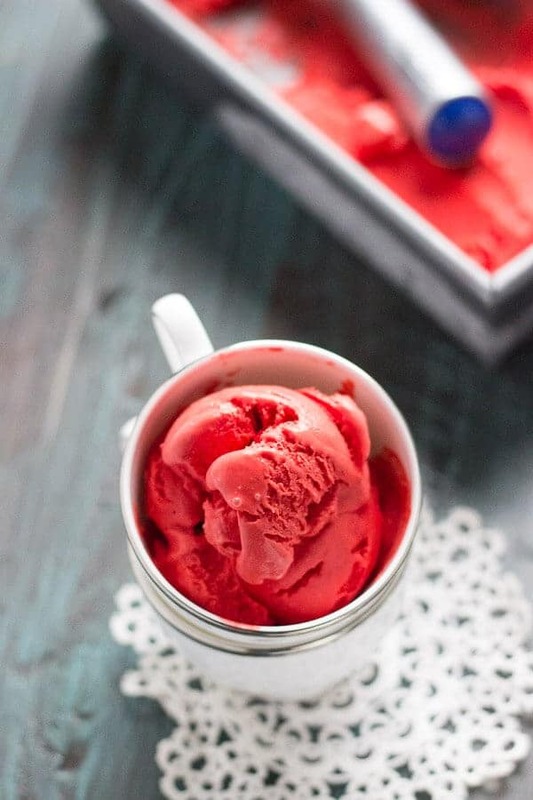 This red velvet cheesecake gelato has a little surprise. Cream cheese makes this lovely dessert tangy and creamy; just like cheesecake. It’s like two desserts in one. 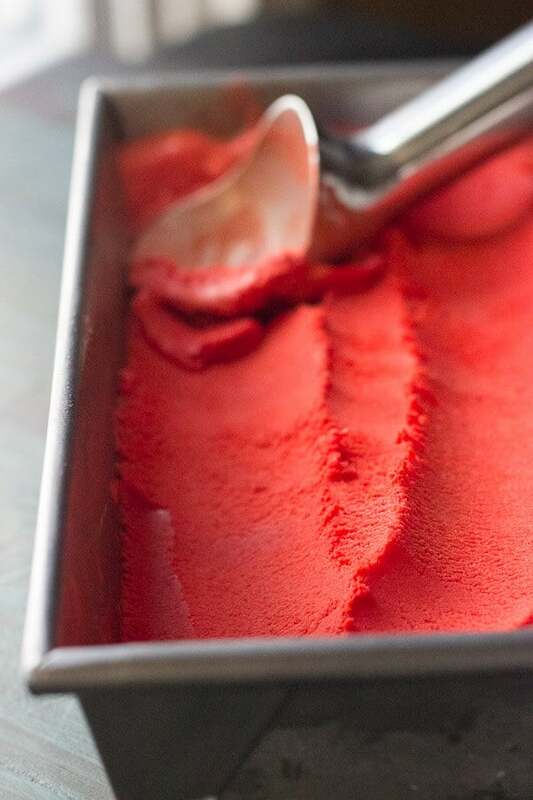 How happy will your loved ones be when they scoop up a luscious spoonful of this shockingly red gelato. Red velvet cake mix gives this cheesecake gelato a chocolaty (and red) flavor. I did add food coloring to this: I really wanted it to be RED. Otherwise the cake mix created a pink color which is lovely all on it’s own. I love red velvet treats: red velvet steamers and red velvet donuts. Can one have too much red velvet? Turn down the lights, grab one bowl, two spoons and share some cheesecake gelato with someone you love. 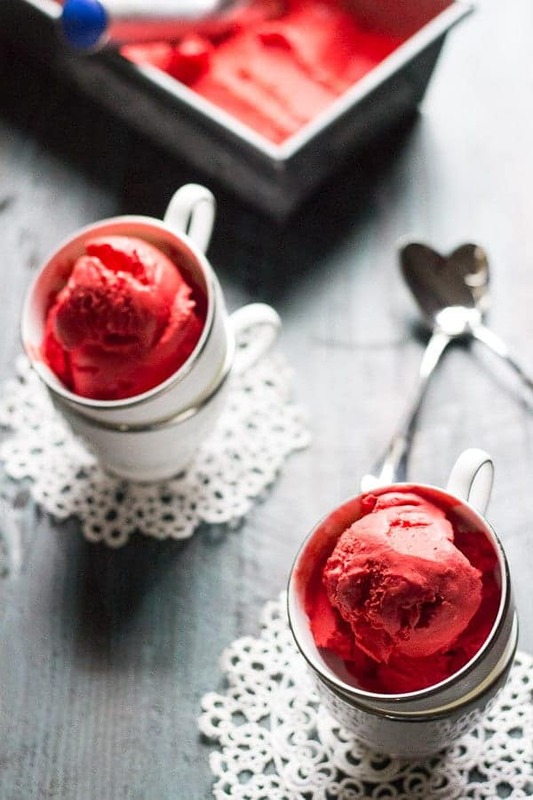 Fall in love with cool and creamy red velvet gelato. In a saucepan, combine sugar, half and half and 2 cups of milk over medium heat. Whisk in cake mix powder. In a small bowl, whisk together cornstarch and 1/2 cup milk. Stir cornstarch mixture into into half and half mixture and bring to a boil. Cook 2 minutes stirring constantly. Strain mixture over a fine sieve. Repeat if necessary. All lumps should be removed. Pour mixture into a blender along with softened cream cheese. Blend completely. Add food coloring if desired. Refrigerate for at least 1 hour or overnight. Process in an ice cream maker according to manufacturers directions. 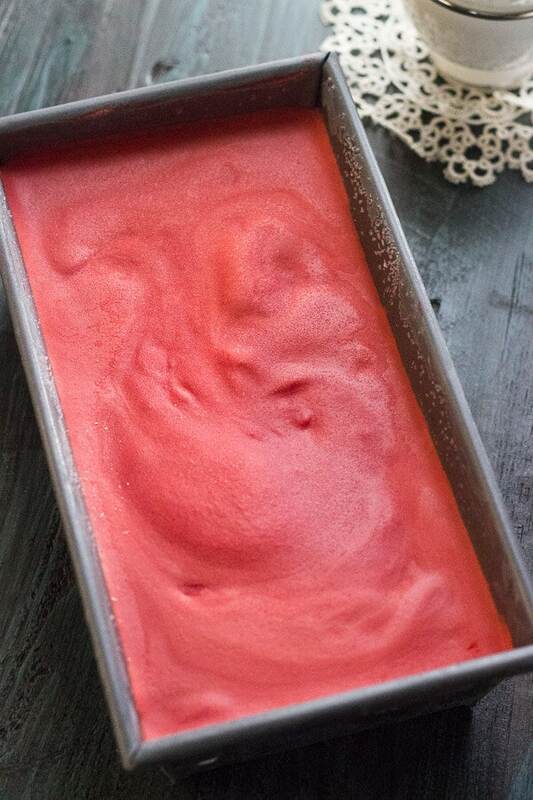 Pour into a freezer safe container and freeze for at least 2 hours. I love the vibrant color in this gelato! My daughter has a birthday coming up and I’ve been trying to think of something special to make to go along with her cake. She loves gelato, and this is just perfect! What a gorgeous recipe! I agree that gelato sounds so much better than ice cream. This gelato looks amazing! This is a perfect dessert for Valentine’s Day. Such a creative recipe! The addition of the cake mix is so interesting! I can’t wait to try this! 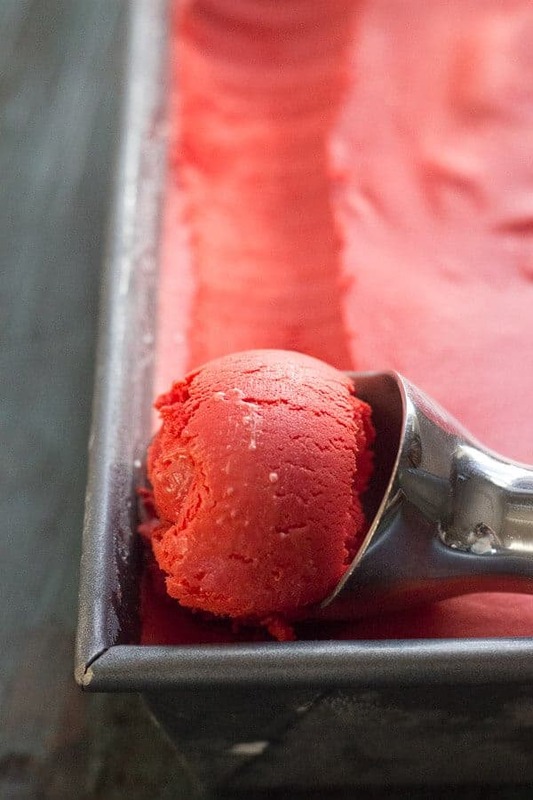 Wish I had a couple of scoops of this red velvet and cheesecake gelato right now. It looks incredible! There is nothing I dislike here! Galeto is always my husband and I’s dessert of choice on our date nights! This would be so perfect for Valentine’s Day! Love gelato! Perfect Valentine’s Day dessert! Mmmmm now I want to try this gelato and feel all sophisticated instead of eating boring old ice cream! This gelato sounds so amazing! Can’t wait to try it! I do not have an ice cream maker, what other way can I make this?? I follow the recipe instructions, except pour the cream into a freezer safe container. Whisk your mixture after 20 minutes. Refreeze. Repeat process until your mixture thicken and resembles ice cream. What does the boxed mix add to the recipe? Is it for flavor? 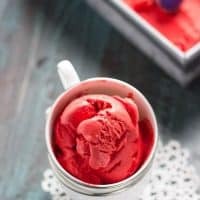 Could I use red velvet emulsion instead or is it also for texture? One more question, could you tell me what the tin is called that you are using to store the gelato? LOL, no worries! I have never used an emulsion, so I’d love to hear about it. I used a Calphalon bread pan, I love using it for ice cream, keeps it nice and cold!